The Division of Student Affairs has partnered with the Division of Athletics in several ways to assist student athletes with their nutrition and medical needs and encourage them on the field by bringing more recognition to their games. One collaboration involves Dining Services, who hired Charles Ashford as the sports nutritionist this past summer. 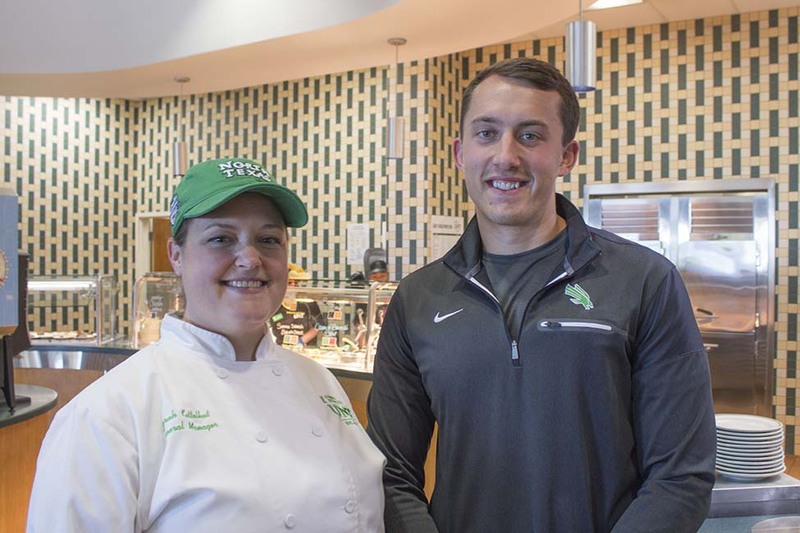 Ashford serves as resource for all student athletes and the sports staff by devising healthy menus and educating the athletes on the importance of proper nutrition. Ashford also travels on the road with the student athletes and works with hotels in creating healthy menus. His main focus has been on the football team so far, but he plans to extend his services to the other teams as well by building a comprehensive sports nutrition program at UNT. “This is a great opportunity to build something from the ground up, and I’m excited to see what we can achieve,” said Ashford. Ashford also works closely with Champs Cafeteria and Sarah Kettelhut, chef and general manager, in creating healthy food options. Champs implemented a new “Dot System” that allows athletes to easily identify menu items for their specific diet needs. Athletes who are trying to improve their body composition can easily identify options better suited to their goals. The nutritional needs of one athlete can be completely different for another and may change from day to day or during different parts of a season. Creating a “dot system” so that athletes can quickly identify food items has helped individual players choose their foods successfully at each meal. Providing a space for performing full physical examinations prior to the fall season and seeing student athletes in the clinic for illnesses when the team doctor is not available. Performing all of their Sickle Cell screens for the student athletes at a much reduced cost and quicker (within one day) turn around. Providing laboratory testing and x-rays services for the team doctor when he holds a clinic at the athletic complex. SHWC provides this service at a reduced cost and quicker turn around than sending them to an outside facility. Handling and filing claims for international student athletes who have the new International Student Athlete Insurance policy underwritten by United Healthcare Student Resources. 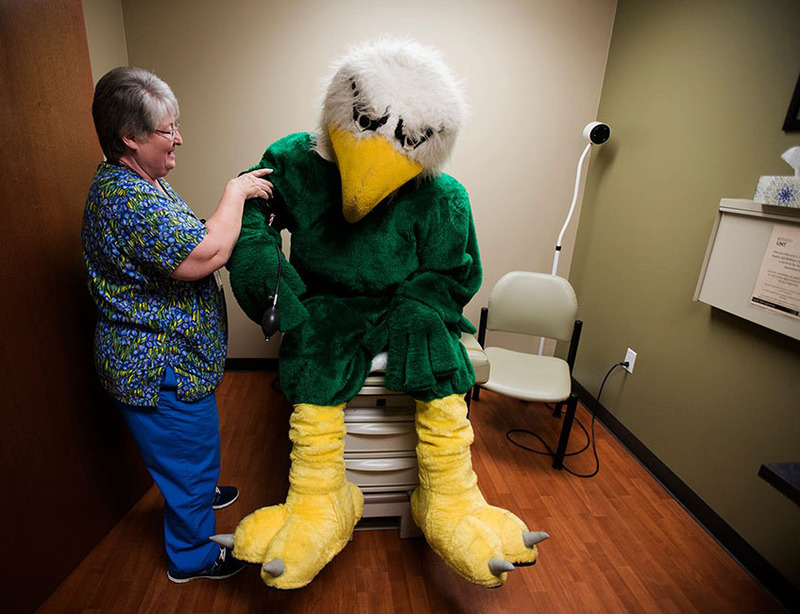 “Student athletes enjoy the convenience of getting medical care on-campus, and Athletics saves money by using us, so it has been a beneficial partnership for everyone involved,” said Kathy Brewer, director of nursing. Student Affairs also offers a tailgate or has giveaways, food and water available at every home football game to encourage student attendance. 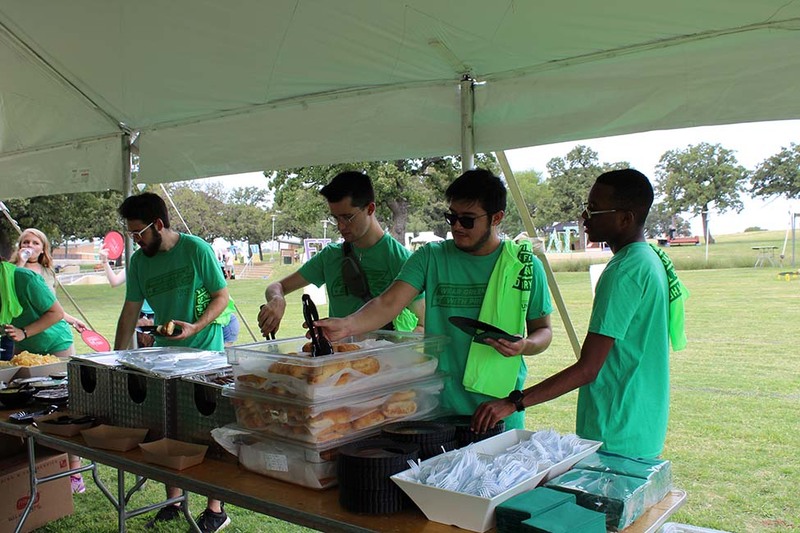 The division partnered with Athletics and Advancement to offer a tailgate for students at the Cotton Bowl in 2016. In addition, for the UTSA/UNT game, through another partnership with Athletics, Student Affairs offered two students the chance to win a Mac Book Pro and five student organizations the chance to win $1,000 each for their organization, assuming 40% of membership attended. Twenty organizations submitted their rosters for the contest. With these successes, more partnerships with Athletics are sure to follow.